Stepped Reamers are for use enlarging the hole in aircraft propellers (not for use on wood props) whilst maintaining centring. Since they cut the material accurately, your propeller will run more concentrically, thus reducing vibration, a major cause of engine/radio wear! It's even possible to remove the handle and mount the cutting bit in a drill press for added precision! 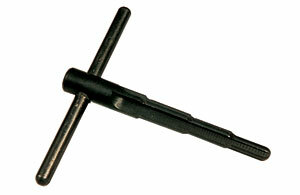 Taper Reamers are used primarily for cutting holes in model car body shells.